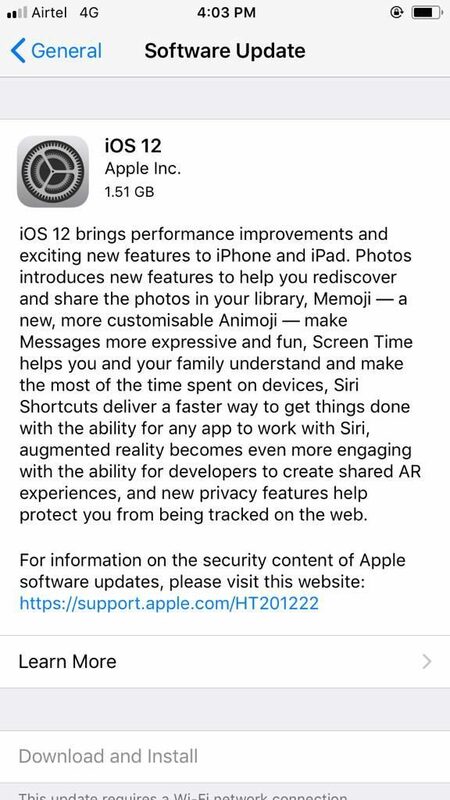 As promised, Apple has now started to roll out the latest iOS 12 software update to compatible iOS devices. The software was in beta for quite some time, and was finally given a public release date during the iPhone Xs launch event. It is now available as an OTA update to all those who were running the last version of iOS 11. Apple had released 12 developer betas for iOS 12, and one Golden Master edition, before releasing the final public update yesterday. If you’re a developer, and are running on the Golden Master version, then you don’t really have to update, as the public update is the same. Also, going forward, if you are on the GM version, you will continue to get newer beta updates. Not all iPhone versions can run the latest iOS 12 software. The new iPhone Xs/Xs Max, and the iPhone Xr, will come pre-installed with iOS 12. Here is a list of all the devices that are now getting the new software update. If you have got any of the above devices, then you can install the new software update and enjoy all the new features and improvements. Apple has included plenty of new features on the latest iOS update, but most of them will only be affecting the newer iPhone and iPad devices. Yes, the older phones will also see some improvements in performance, but the improvements will be bigger on the newer devices. There are a few new apps such as Measure, Shortcuts, and the update brings support for ARKit2. There’s a new feature called Screen Time, which allows users to track the amount of time spent on a device. Parents can also track what their kids are doing on a device. The iBooks app has been replaced with Apple Books, the Messages app gets personalized Memoji, and four new Animoji. A new ‘For You’ section is available in the Photos app. The notifications have been improved, and you now get group notifications from the same app. There’s a new Do Not Disturb During Bedtime feature, and Safari gets Intelligent Tracking Prevention. The Safari feature lets you disable the like and share options in websites. Apple has also improved Maps, and it now comes with first-party date. The CarPlay feature has also been improved, and can run third-party navigation apps. iPad users can now get access to the Voice Memos and Stock apps, which weren’t available on the tablet. The tablet also gets the iPhone X navigation gestures. There are plenty more smaller changes and improvements in the latest iOS 12 update. We recommend you install the update, unless you’re jailbroken, then you can skip it.